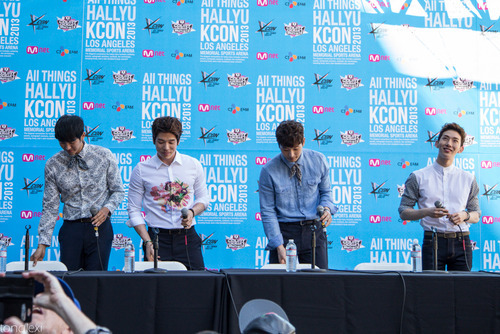 Screams, sunburns, sundubu (Korean stew), scratchers, and signings: all these things were found at Kcon 2013 – the massive K-pop convention held in Los Angeles, CA that had the goal of bringing Korean music and culture to the doorsteps of international fans. There were many magical moments during the weekend event, but there were also some glaring organizational problems that threw a wrench in the average fan’s good time. This is the convention’s second year; with the creation of any large festival or convention, there is a growth period that has to occur. Rome was not built in a day and neither was Kcon. Perhaps this concept should be made clearer to Kcon attendees, because the belief that a perfectly organized and smooth running convention is the norm is extremely misinformed. Even conventions that have been around for years – Comic-Con, for example – still suffer from unexpected situations and inevitable chaos created by huge mobs of people. Considering that this is only the event’s second outing, Kcon’s organizers are doing admirably well. To put it into perspective, a staff member confided in me on Saturday, right after the convention started, that they hadn’t slept for four days, and I would be willing to bet that they didn’t sleep until sometime on Monday once the convention was all cleaned up. An event on the scale that Kcon is trying to achieve is bound to have a kink or two. Unfortunately, there were some pretty major issues that were impossible to ignore or write off as beginner’s folly. For one, the line to get into the actual convention took hours to get through for some people. This could have been easily avoided by adding additional check-in staff. With a crowd that large, you need way more than two or three check-in booths. In fact, upward of ten check-in stations would’ve been more practical for the size of the crowd. In the end, the line of people waiting to check-in wrapped around the block, and the slow process kept con-goers from enjoying panels that occurred early in the day. By the second morning, the staff had partially fixed this issue by pulling con-goers with early artist engagement sessions to the front of the line. However, these efforts left out people who were there for early non-artist panels, such as dance workshops and K-drama panels. The priority statuses of VIP ticket holders was also muddied up during the check-in process. VIP attendees had doled out three times the amount of money for their tickets, yet it did not give those ticket holders much of an advantage because the general admission line was allowed to go in simultaneously with the VIP line. Some unfortunate ones got into the convention after regular ticket holders were admitted. I don’t know what Kcon’s operational staff were thinking but if I were a VIP ticket holder, I’d expect smoother access on all fronts. This brings the convention’s problems back to the check-in system — the con already started off on the wrong foot. 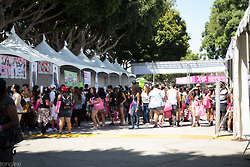 A big topic of contention at last year’s Kcon was the “voucher” system — for getting into artist engagements — that was widely recognized as a terrible arrangement; fans were running around like headless chickens, and K-pop idols were left smothered to death in sweltering tents. This year, the issue was resolved by leaving the selection up to luck, in the form of “scratch tickets” given to attendees as they checked in. A new, more secure, venue was also designated for all artist sessions. A few issues did still arise, however. First, the tickets were not shuffled, so everyone that arrived in the morning got 2AM and everyone that arrived later got Dynamic Duo, and so forth. 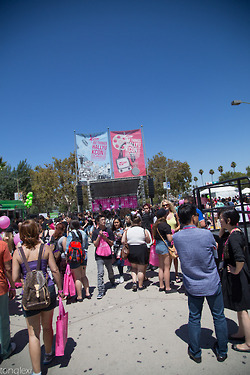 Tickets were allowed to be traded, which was an excellent choice on Kcon’s part, but people were still dissatisfied with the actual “randomness” of their ticket selection. Another issue was the misleading information about what exactly would be available at each artist engagement. This is one issue that was unfairly blamed on Kcon when the blame truly lies elsewhere. It’s safe to say that SM Entertainment had put its foot down in disallowing Exo to go through with fan-interactive “hi-touch” sessions. Similarly, it was also apparent that G-Dragon made a decision to forego his autograph and “hi-touch” sessions. Unfortunately, as Exo and G-Dragon were both very popular among con-goers, these decisions left many people unhappy. By this point, few “scratch tickets” remained and this left the aforementioned goers even more disappointed. While the random entitlements of artist engagement have presented as a step up from last year’s system, there are still some wrinkles to iron out in order to ensure that each attendee has a fair chance with their favorite group(s). 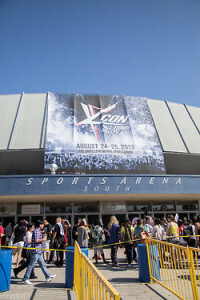 Repeat goers can only hope that there will be better communication and a better understanding between Kcon staffers and the entertainment companies being brought in next year. On top of bringing in the most interesting talents, the organizers need to reevaluate their internal processes so that fans aren’t caught off guard and left helpless. Lastly, the queueing procedures needed much more forethought. There was no system in place to control the lines of fans waiting for artist engagements or booths or the concert. I must give credit where credit is due, however, because Kcon did manage to pull their act together quickly on this front. By the time the second artist engagement panel had rolled around, the staff realized that something needed to be done – such as the putting up of warning tape to simulate an amusement park style snaking line – to keep fans more organized. Hopefully, this type of organization will be planned in advance for next year to keep everything running smoothly from the get-go. As for the concert line-up, there are no words to describe the insanity that were the VIP 1 and VIP 2 lines. This was possibly the worst handled situation of the entire weekend. What Kcon should have done was assign VIP 1 and 2 ticket numbers — even though they didn’t have seats — at the time of purchase; attendees would then have to line up according to their allotted numbers. It would’ve been easy to number and count the tickets as they were bought and this would’ve created an orderly way for fans to arrange themselves when the time for the concert came. Unfortunately, what happened instead was a literal stampede of screaming fans that commenced to crush, trample, and shove each other in an attempt to be the first in line. For those poor souls unfortunate enough to end up in the center of the VIP 1 mob, I am truly sorry. What followed was a multiple hour process of security screening that progressed slowly. And I mean slowly sorting fans into three separate, very carefully blocked off, single-file lines. Hundreds of cut-throat teenagers is probably a sight those guards will never forget. 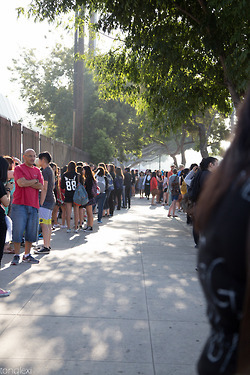 This entire situation was exacerbated by Kcon staff refusing to tell people where the line for the concert was going to start until just before four in the afternoon, the official time designated for the lining up to start. Speaking of Kcon staff not sharing information, the lack of knowledge Kcon volunteers were prepped with was baffling. Volunteers weren’t even aware of some of the official events occurring, such as the cosplay contest, and likewise couldn’t point con-goers in the right direction to watch or participate in said events. Obviously, a lack of clear communication was an issue not only between Kcon and the fans but also between Kcon and their own employees. To be fair, a lot of Kcon information was communicated to attendees through the bi-weekly YouTube live-chats prior to Kcon and it was people that didn’t tune into those that seemed to be in the dark at the actual convention. While the live-chats were fun, they weren’t a time-efficient or practical way to share necessary information with con-goers. A more straightforward, easily accessible, text version of everything that was said in those videos would have been a boon to Kcon attendees. All of these issues seem to stem from one major oversight; the underestimation of international Kcon fans. I’m not referring to underestimating fans’ passion for K-pop or their desire the see K-pop groups, but rather an underestimation of the sheer number of fans they’d be dealing with. Sure, you’d think Kcon would have a number for tickets sold somewhere that would indicate how much effort they should put into the organization of crowds, but judging by the lines, that was not the case. If Kcon staffers had truly prepared for and anticipated the amount of attendees as there were, there would’ve been more check-in booths, a better game-plan for handling the concert entrance, and far more space for lining up for artist engagements. Perhaps the Kcon staff simply didn’t realize that international fans would go so far to see their favorite groups, and see them as up-close as possible — if not more — and in a similar fashion to fans living in Korea. For some people, this was their one chance to see their idols in person and that kind of devotion lends itself to lining up hours in advance to get the best view possible. Kcon should have expected that level of fan dedication, and if they didn’t, well, they don’t know K-pop fans nearly as well as they claim to. If you’re going to go, go big, and especially go big when it comes to planning ahead. As Kcon continues to grow and develop, it is likely that these issues of organization will be resolved. Each year is a learning experience for both Kcon staff and con-goers. Despite some minor kinks, the convention was an excellent place to experience Korean pop culture, music, food, and dance; it was also the perfect space for interacting with other fun-loving K-pop fans. International K-pop fans had a chance to experience many things they might not have had a chance to experience anywhere else and for that we must all be thankful. Given the chance, I’ll be attending Kcon again, to see how the management of this large scale develops down the road (just kidding about that second part, mostly). Did any of you attend Kcon? How awesome was your experience?